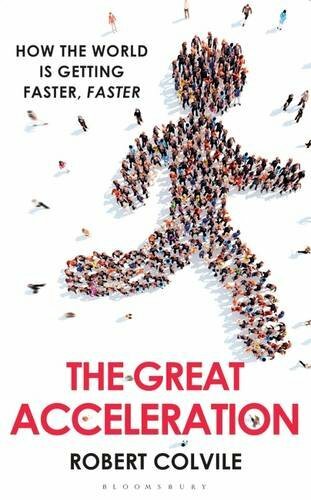 It's a week to go until 'The Great Acceleration' hits the shops, and it's already getting some encouraging attention. It started last Monday with an appearance on 'Start the Week' with Andrew Marr to discuss whether faster really is better - you can listen to the episode again online, or download the podcast. I also went on Jo Good's show on BBC Radio London to talk about the pressures of city living. The book's also been the subject of a news story in the Times, which was picked up by the Mail. Rosie Millard wrote about my thesis in the final print edition of the Independent - and I appeared in the Sunday Times news review to explain why life really is getting faster. The scariest thing, however, was the appearance of the first review - by Daniel Finkelstein in the Times. Luckily for me, he loved it, calling the book 'excellent' and saying: 'It’s rare to go for a whole paragraph of this book without learning something unexpected, funny or disturbing.' The Times also made it their book of the week. I mention all this not to boast (well, a little), nor to persuade you to buy the book (well, actually...). It's more that I've spent several years wrestling with these ideas, hoping that other people would find them even half as fascinating as I did. It's really, really gratifying that they seem to be doing so.